Overlooking the absolutely stunning Tso Moriri lake in Ladakh’s south eastern Rupshu region, Mentok Kangri (6250 mtrs) is a challenging ascent. The mountain climb begins at Tso Moriri, at the village of Korzok. In Ladakhi, Mentok means flowers. In summer the Korzok valley blooms with wild medicinal flowers giving the peak its name. When you reach the summit it’s a magnificent and heart throbbing view of the entire Changthang region. Despite its altitude, Mentok Kangri can also be climbed as an initial non-technical foray into high altitude mountaineering. Just like Stok Kangri. The ascent of this 6000m plus mountain in 10 days is probably the quickest one can climb it, keeping in mind that one needs some time to acclimatize to the altitudes as well. After spending the first couple of days acclimatizing in Leh during which time we also visit some monasteries and the interesting Leh market, we set off for a week long trek. We approach the mountain after two days at Leh to acclimatize at 3500 metres before moving to Tso Moriri, the stunning turquoise late at 4570 metres. We spend time around the lake, visiting the large Changpa bowl above the lake, where herdsmen of Tibetan descent tend to their herds, living their nomadic lives in yak skin tents. The final climb of Mentok Kangri (6250 mtrs/ 20505 ft) will present a challenge to the fittest of the members. Even after being fully acclimatized and completely in form, one would always find any climb going over 6000m to be a hard one. 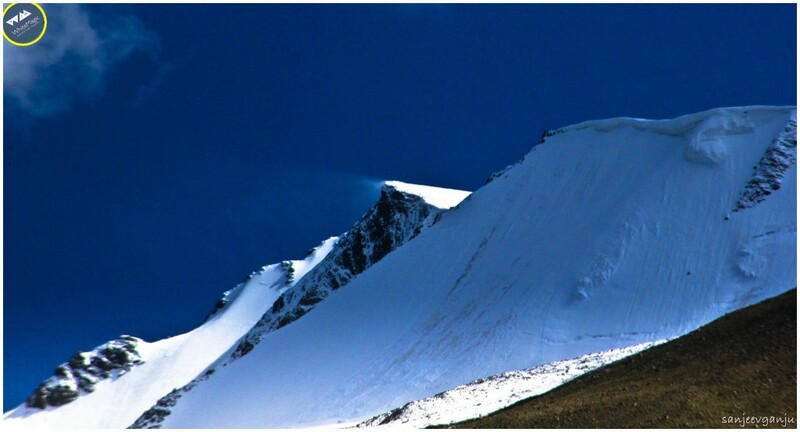 The climb itself is not technically demanding, and on days with good weather conditions, involves going up a steep rocky scree slope and walking up snow and ice to the summit. However with weather becoming more & more unpredictable one cannot rule out a possibility of dealing with some unexpected snow & ice on the mountain. Note: Unless everyone is in good physical shape, which also includes no altitude sickness we will not be able to summit on the long last day to the top and back. Day 03: Leh to Korzog (4570mtrs/ 14993ft) 6-7 hours drive. Acclimatisation Walks. Day 04: Rest at Korzog (4570mtrs/ 14993ft). Acclimatisation Walks. Climb High. Sleep Low. Day 06: Rest at Base Camp (5400 mtrs/ 17717 ft). Get ready for the summit departure at night. Day 08: Base Camp to Korzok. Day 09: Korzog to Leh. 6 – 7 hrs drive. Overnight at hotel.